The Bar Harbor Post Office, a Classic Revival structure. Mount Desert Island is usually applauded for its natural beauty but anyone who has adventured around the island has probably noticed a variety of interesting architectural styles. Whether you want a fun excuse to drive around or just would like to understand how architecture has played into the history of MDI, this post is for you! Note: Many styles on MDI are hybrids of two (or more!) styles but we’ve explained a bit of the base style for context. 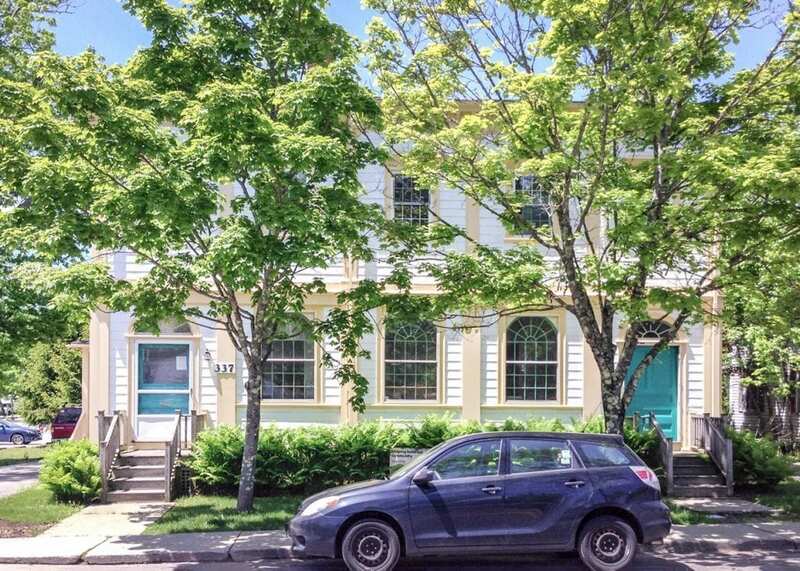 For example, Cover Farm has a Greek Revival main entrance, Cleftstone is shingle with Queen Anne, and the Bar Harbor Historical Society’s building on Ledgelawn Avenue (Bar Harbor) is Gothic and Jacobean. Double Note: We are not architects or historians but cool building enthusiasts. If you are an expert and want to fact check this, please comment below or contact us. (We’re happy to return the favor.) We have sourced most of these images from Wikipedia and originals are linked/sourced and cited below with permission from photographers. If you are a visitor from the Midwest or South, you may wonder, “What the heck is up with this barns? Why did these Mainers connect them to the house? It looks weird.” Yes, a connected barn may look different the first time you see it, but the design serves a very logical purpose. Heat is a very valuable commodity–whether in the 17th century when the connected farm architectural design spread throughout England, Wales, and New England, or today when your paying that massive heating bills in the winter months. By having the barn close to the house, the animal and human heat are able to be shared. In addition, it is easier to carry out farm work when you aren’t trudging through 10-feet snow banks to get to your horses. But it is not only the connected barn that characterizes the connected farm design, it is also the connected kitchen, outhouse, and other structures–all of which I would say are good ideas. I mean, if I had to skate on ice just to get to the kitchen to brew my morning coffee… let’s not even go there. So, whether you think they look at little odd at first or if you think they look great, the connected farm is a great idea when you live in the winter wonderland we do. The typical New England connected farm complex consists of the “big house”, which acts as the standard family living quarters. Connected to the “big house” is the “little house”, which contains the kitchen area. Next to it is the “back house”, which was traditionally a carriage or wagon house. Connected to the back house is a standard livestock barn. This style was banned in many areas due to fire concerns, but the bans were lifted in the 18th century, and they were common throughout New England in the 19th century. Example: Kief Farm is the best example but the barn collapsed a couple years ago… But there are parts of others you’ll see driving along back roads (ex: Norway Drive). In the first half of the 19th century, Americans’ enthusiasm for things democratic spawned a radical turn in architecture, all the way back to the public buildings of the original democracy of ancient Greece. Having just finished the War of 1812, this was a rejection of British architecture sensibility. Usually these homes are painted white (to resemble white marble), have heavy cornices, gables with pediments, columns, and otherwise bold details with simple moldings. The style waned in the late 1800s, but you can still see its legacy on MDI to this day–and no, we’re not referring to the wonderful democracy that takes place in town meetings across the island. 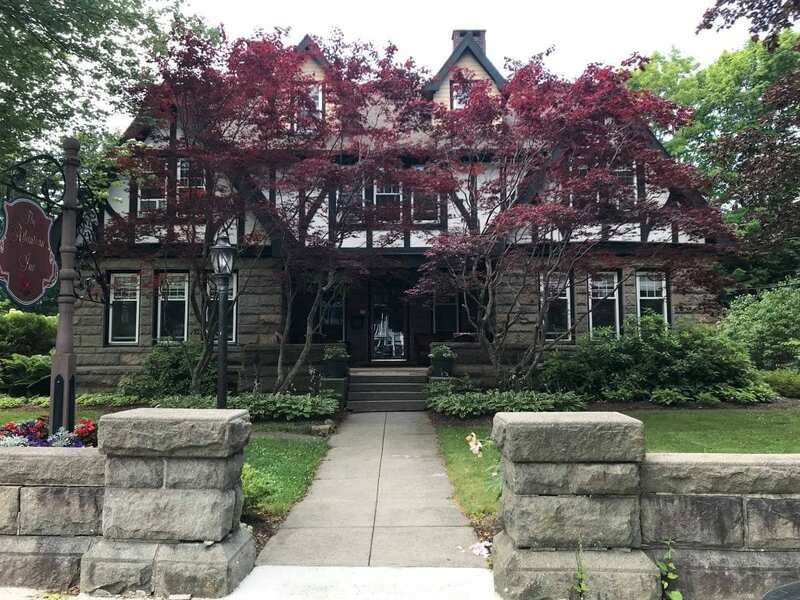 We are talking about the architectural style you can see in buildings such as a the Bass Harbor Memorial Library, which is appropriate because knowledge is the bedrock of democracy. A saltbox house is a traditional New England style of house with a long, pitched roof that slopes down to the back. A saltbox typically has one story in the back and two stories in the front (I like to refer to it as the reverse mullet, but like I said I am no architect). The flat front and central chimney are recognizable features, but the asymmetry of the unequal sides and the long, low rear roof line (this style of room is also called a catslide roof) are the most distinctive features of a saltbox. 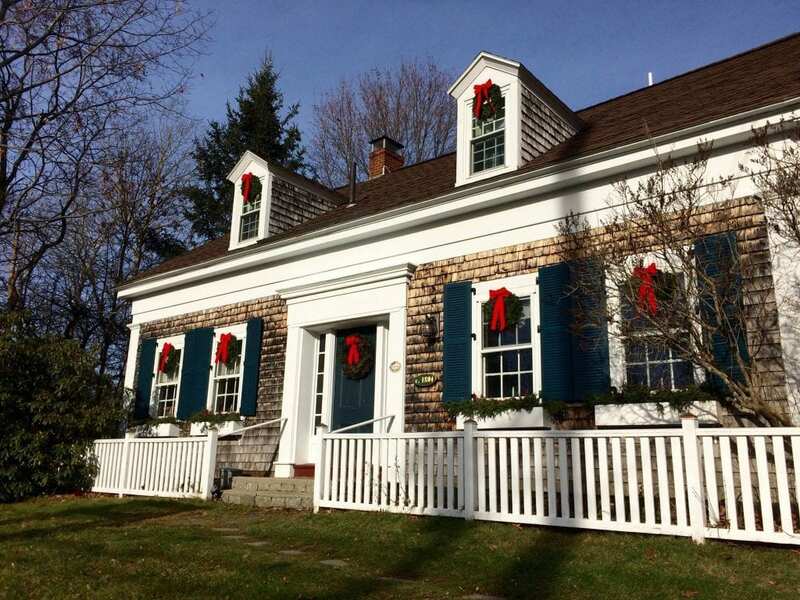 Another distinctive feature is that saltbox houses look majestic and beautiful. That is my opinion at least–do you agree? The origin of this design is interesting because it wasn’t originally developed by a famous architect commissioned by a wealthy nobleman or heiress. Instead, it was regular homeowners who simply wanted to add to their house without disrupting the front appearance. The earliest saltbox houses were created when a lean-to addition was added onto the rear of the original house, extending the roof line sometimes to less than six feet from ground. The style was popular from the 1600s through the mid 1800s–but still looks great today and can be seen on MDI. The Atlantean in downtown Bar Harbor. “Cottages”/Shingle Style The Shingle style is an American architectural style made popular by the rise of the New England school of architecture, which eschewed the highly ornamented patterns of the Eastlake style in Queen Anne architecture. The style conveys a continuous volume of the house, often accented with flat shingled surfaces, the horizontal shape of the overall house, and the emphasis on horizontal continuity, both in exterior details and in the flow of spaces within the houses. Fred Savage (not to be confused with my childhood crush from The Wonder Years) was the most influential architect in the development of Mount Desert, designing over 300 buildings, including most of the summer cottages in Northeast Harbor during the late 19th and early 20th centuries as well as many summer houses in Bar Harbor and other parts of the island. Early on, Savage met prominent Boston architect, Robert Peabody who had designed a house in Northeast Harbor. 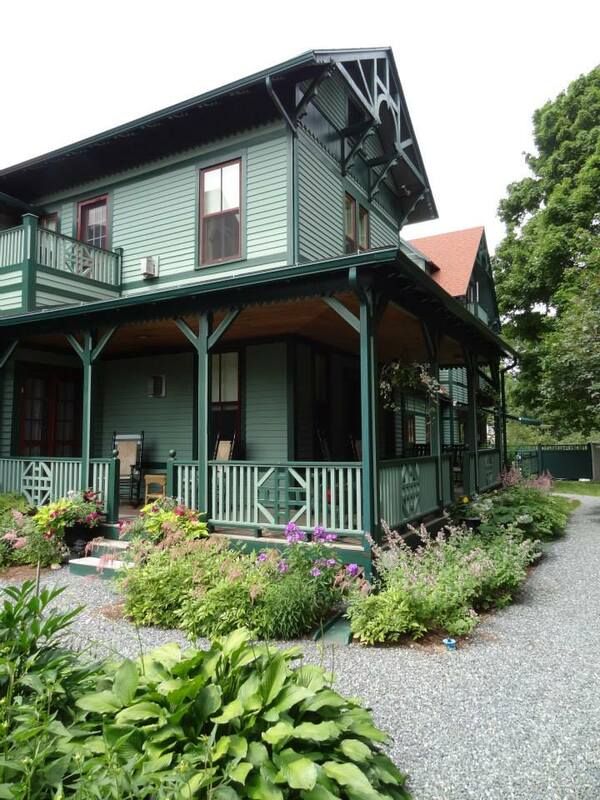 It is due in large part to Peabody’s tutelage of Savage that Mount Desert Island is a mecca for superior late nineteenth and early twentieth century Shingle style architecture.Fred Savage did a lot of Shingle style and stone, but most of the “Cottages” are a mix of styles that were commissioned and based on what the owner wanted. Nicole, can it be explained why “Cottages” is in quotation marks? MDI’s definition of ‘cottage’ might be a bit grander than you are used to. Tourists that traveled to the island after the Civil War prompted a building boom of cottages, hotels, and various buildings in Bar Harbor and other towns in the vicinity. In roof, chimney placement, and cladding, Georgian houses are similar to Colonial style. They are typically bigger, usually two stories high and two rooms deep, and the roof is only moderately pitched. Many are unpainted and often shingled, but some scholars believe they were originally painted in blue-green, salmon, and mustard-yellow colors. Georgian houses are best identified by the orderly plan of their windows and doors. The windows march across the second story, usually at even-spaced intervals and almost always in odd numbers of three, five, or seven across. The lower-story windows appear directly below the uppers with the doorway in the center, making the facade exactly symmetrical. The Stone Barn Farm (near a Greek Revival farm house c. 1850 and carriage barn on the corner of Crooked Road and Norway Drive in Bar Harbor) was created out of glacial till, and has a two-leaf board-and-batten door providing access to its interior. The Shea Brothers masonry firm may have built the stone barn as a vehicle to showcase their building skills, but it is common throughout New England to see rock walls constructed of these leftover ‘erratics’ from melting glaciers. As farmers were clearing the fields, they pulled plow-impeding stones and piled them on the edges, creating enough stone walls in New England to circle the globe multiple times. So the Stone Barn was a more ambitious project with the same raw materials! Gothic Revival (also referred to as Victorian Gothic, neo-Gothic, or Gothick) was popular in the early 19th century and peaked around the 1870s. Gothic Revival features are inspired by the original Gothic style, including decorative patterns, finials, lancet windows, hood moulds, and label stops. The amount of Gothic decoration varies widely and sometimes there are just a few touches on a building constructed with contemporary materials. In the United States, the so-called “Queen Anne style” is loosely used of a wide range of picturesque buildings with “free Renaissance” (non-Gothic Revival architecture) details rather than of a specific type of construction. It was popular 1880 to 1910. Some “Queen Anne” architectural elements, such as the wraparound front porch, continued to be found into the 1920s. Other details may include an asymmetrical facade, dominant front-facing gable, overhanging eaves; tower(s), differing wall textures, terra cotta tiles, and oriel and bay windows. This was a late-19th-century American style between the Carpenter Gothic style of the mid-19th century, and the Queen Anne style that it had evolved into by the 1890s. Named after its use of linear “stickwork” (overlay board strips) on the outside walls to mimic an exposed timber frame, and is recognizable by the relatively plain layout, accented with trusses on the gables or decorative shingles. The stickwork is not structural; the narrow planks or thin projections applied over the wall’s clapboards for decoration only. Châteauesque or Chateau Style is based on the architecture of French country houses (châteaux) built in the Loire Valley from the late fifteenth century to the early seventeenth century. The style features buildings incongruously ornamented by the elaborate towers, spires, and steeply-pitched roofs built on an asymmetrical plan with the roof-line broken in several places. Federal-style architecture is the name for the classic architecture built in the newly founded United States between 1780 and 1830. American Federal architecture typically uses plain surfaces with attenuated detail, usually isolated in panels, tablets, and friezes. It also had a flatter, smoother façade. The mass constructing and town planning by the federal government was expressed in federal projects of lighthouses, harbor buildings, and hospitals. In short, while Mount Desert Island abounds in natural beauty, you could also take in the architecture and enjoy a different kind of beauty on MDI!